The Growth Coach’s mission is to help business leaders build more successful business and more balanced lives. The Growth Coach – OKC serves all of Oklahoma City and the surrounding areas. Will and Ashley Hart are excited to announce the launch of their new business and sales coaching company, The Growth Coach – OKC. 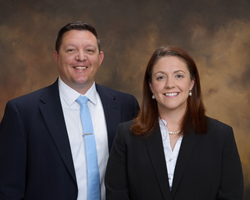 With Will’s management experience in the gas and oil industry and Ashley’s expertise in organizational leadership, the two are looking forward to making Oklahoma City an even better place to live, work and play. The Growth Coach is the largest provider of affordable group coaching workshops in the nation, but coaches also offer group and one-on-one coaching for sales professionals, managers, management teams, self-employed professionals and more through a wide variety of programs through three industry-leading series – their Foundational Series, Fundamental Series and Fast Forward Series. The Growth Coach’s mission is to help business leaders build more successful business and more balanced lives. The Growth Coach – OKC serves all of Oklahoma City and the surrounding areas. As Growth Coaches, the Harts are certified in The Strategic Mindset coaching process, which adheres to the standards, practices and policies that the International Coaching Federation has set forth in their Code of Professional Standards and Ethics. The company’s landmark Strategic Mindset Process is so effective that it comes with a money-back guarantee. Will has more than a decade of experience in the oil and gas industry, working in business strategy, business processes and supply chain management. With a natural ability to lead high-impact groups and, as a U.S. Navy veteran, Will has served and managed at the highest levels of military and corporate organizations. With more than 20 years in management and supervision, Will is also a SAP expert with multi-module experience. He believes in empowering leaders to be the best versions of themselves so that they can build better families, better businesses and better communities. Ashley holds a master’s degree in education and has a strong background in building organizations, especially non-profits. Prior to launching The Growth Coach, she coordinated the launch of a start-up non-profit from the ground up. A passionate educator at heart, Ashley is a certified behavioral consultant in the DISC system, the former Director of Youth Prevention at Serenity in Abilene, Texas and a leader for women entrepreneurs in Oklahoma City. She also serves as the vice president of the board of MOMS. INC, a non-profit organization that blesses mothers of children with special needs. Her drive to see other’s succeed is what fuels her passion and energizes her determination. “When we stepped back and thought about what we wanted to do with our careers, we both agreed, if everything was on the table, business coaching would be what we’d choose to do. We had been looking at The Growth Coach for a while and, when we had the opportunity to pursue opening our own business, we jumped at the chance. We feel like this is what we were both born to do and, with our complementary backgrounds, we have the experience, expertise and training to make a positive impact on this community through The Growth Coach – OKC,” Ashley said. Will and Ashley are married with three children and they love Oklahoma City. They enjoy the outdoor activities that the River Trail brings, youth sports, Special Olympics and the Oklahoma City community. They are building The Growth Coach – OKC so they could make Oklahoma City their permanent home, raise their family here and invest in this great city. For more information about how The Growth Coach – OKC can help you find more success and balance, call (405)285-6677, email AHart(at)TheGrowthCoach.com or WHart(at)TheGrowthCoach.com, or visit http://www.TheGrowthCoachOKC.com.